As the New Year festivities are here, I thought it would be a good idea to compile a selection of Soviet films that are either about the New Year’s celebration or that are traditionally shown on Russian TV during this time of year. As many readers will know, Christmas is not celebrated in Russia to the extent it is in the Western world, and therefore New Year is the main holiday of the season. Soviet comedies are a source of great pride for Russians, and in a country that still struggles with the articulation of its national identity, they offer one of the strongest unifying links for its incredibly diverse and in many ways divided population. Around every holiday season Russian TV gets flooded with these comedies. This means that not only do most Russians know a lot of these films by heart but they have also become an integral part of Russian family traditions, rituals and, of course, language, since the quoting of classic Soviet comedies is something of a national sport. The canon of these films is quite large and this list is by no means exhaustive, but my choices were driven by several factors. The film had to be available for free online with English subtitles (which was made easier by the fact that Mosfilm, the largest Russian film studio, has been putting up its most classic films on Youtube and providing them with subtitles for some time now). Amongst the available films I went for the indisputable hits. I also considered how well the humour of the film translates, as well as my own personal tastes. A melodrama, with elements of social satire and plenty of music, Irony of Fate has become as much a part of Russian Yuletide tradition as the tree, champagne, Ded Moroz and the chiming bells of Spasskaya Tower of the Moscow Kremlin. This Soviet fairy tale, which could only have developed out of the frustrations of the mid-70’s Soviet city-dwellers, begins in a Moscow state-planned suburb, when a middle-aged doctor (Andrey Myagkov) goes to a sauna with his school friends to celebrate the New Year as well as his engagement. They all get terribly and inevitably drunk, a confusion ensues and the doctor ends up asleep on a plane to Leningrad. On his arrival, still wasted, he gives a taxi driver his home address and is driven to a Leningrad suburb to the street of the same name, the house and the flat with the same number, and opens the door with his key, which was carefully universalised just like everything else in those city suburbs by the “loving” state. The romance that slowly plays out as a result of this only very slightly unrealistic meet cute situation is a delight to watch if you’re into romantic comedies and a bit of tasteful schmaltz (which I certainly am). It is very much an actor’s piece, and a showcase of some of the best-loved Russian thespians and one magical Polish actress, Barbara Brylska. For me the best part of this movie, however, are the songs by the great Mikael Tariverdiev which use the poetry of writers like Marina Tsvetaeva, Boris Pasternak, Bella Akhmadulina and Yevgeny Evtushenko. I believe that the presence of the genuinely great poetry does highlight some of the silliness of the romantic comedy genre. However, if you do not speak Russian then you might be at an advantage, since the translation of the songs in the subtitles is rather poor and you won’t be distracted by what could come across as an unfortunate mix of “high” and “low” art. Carnival Night is another New Year classic directed by Eldar Ryazanov. In fact, this is his big debut which made him into a star director and catapulted its lead Lyudmila Gurchenko onto the very top of the Soviet cinematic Olympus. Undoubtedly my favourite New Year movie, Carnival Night surprisingly stands the test of time despite its satire being firmly grounded in the socio-political context of 1956, the year of Khruschev’s speech “On the Cult of Personality and Its Consequences”, which kick-started the liberalisation of the Soviet Union. The reason for the film’s endurance is that its main theme (however politically conformist in the year 1956) of the joyful youth rebellion against the shackles of the old and stifling order is universal and exhilarating no matter the political affiliation. Plus the politics are never made explicit here, and one is free to ignore the movie’s subtext and go along with just the laughs. The plot is based around the organisation and running of a big New Year celebration in a culture club in some kind of big and unnamed Soviet institute, which nicely functions as a microcosm of the society at large. An old-school (read ‘Stalinist’) bureaucrat, comrade Ogurtsov, is put in charge of the festivities. His ideas of New Year’s party fun include a 40-minute reading of a statistics report and a lecture on “Is There Life on Mars?”. The young and energetic group of friends, who are there to do the actual organising, know that they cannot openly disagree with the authority on what constitutes ‘fun’. They decide to nod-along to comrade Ogurtsov’s suggestions, but do everything in their own way. The resulting comedy is superbly conceived and executed, not least due to its ensemble cast (always the strength of Ryazanov’s films) which makes the whole thing sparkle. And don’t forget an endearing young puppy love, endlessly quotable dialogue and some brilliant song & dance to go with it. Since becoming the box-office smash hit of 1972, and one of the highest-grossing Soviet films of all time, this comedy’s popularity has never waned. If one could conceivably collect data on the frequency of movie dialogue appearing in the everyday use of Russian, my guess is that Gentlemen of Luck would be somewhere in the top 5. Aleksandr Seryi, the film’s director, was a man of troubled fate, with a reportedly explosive temper and prison experience. All of this must have contributed to the artistic success of this film about a gang of criminals on the run led by a kindergarten principal, who had been infiltrated into the group by the police because of his uncanny resemblance to the gang’s actual leader. 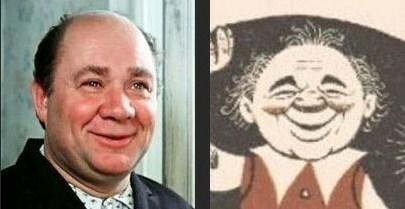 Both the gang leader and the principal are played by the endlessly lovable Yevgeny Leonov, also the voice of Russian Winnie-the-Pooh and an inspiration for the drawings of Bilbo Baggins in the first Russian edition of The Hobbit. Much of the film’s humour, as well as emotional power, rests on the contrast between the cuddly and endearing demeanor of the kindergarten principal, and his attempts at learning the appropriate prison slang and physical mannerisms of a tough criminal. Despite successfully fooling the gang members, however, he never loses his caring nature and effectively treats the gang members as children in need of love, care and education. Eventually, of course, the criminals have to face their conscience and rethink their lives. But what might seem like a classic socialist tale of re-education has a much more ambiguous ending than one might expect, reflecting the level of discernment in the Soviet audiences of the 1970’s. Structure aside, however, Gentlemen of Luck is a rollicking yarn filled with fast-paced silliness, hilarious culture clashes, and a fantastic array of characters. And even the film’s rhythm problems resulting from censorship cuts do not undermine its enduring power to entertain. Another box-office smash hit, this film was directed by Leonid Gaidai, the only other Russian comedy director who can compete with Eldar Ryazanov’s universal popularity. The styles of their films, however, could not be more different. If Ryazanov’s comedies are almost always verging on melodrama and are rooted in character development, Gaidai’s humour is often very physical, whimsical and with plenty of good old slapstick that draws its inspiration from the silent era. And Operation Y is a great example of just that. The film consists of three short novellas, a format which feels only natural for this type of comedy, especially considering that Gaidai’s early shorts, Dog Barbos and Unusual Cross and Bootlegers (both 1961), effectively made his name. The unifying link between the novellas is the character of Shurik, a nerdy, resourceful and lovable student played by Aleksandr Demyanenko. He re-educates a hooligan and a social parasite in the first novella Workmate (“Напарник”); falls in love in the superbly choreographed meet-cute set-up of the second novella Déjà vu (“Наваждение”); and in the eponymous third novella fights an inept band of criminals, the well-established (by Gaidai) cinematic comedy trio of The Fool, The Coward, and The Experienced (Трус, Балбес и Бывалый). Operation Y is a fest of delightful silliness and slapstick, all bright colours and nostalgia-evoking 1960’s designs. A perfect light entertainment with fantastic characters whose popularity meant that both Shurik and the trio of inept criminals appeared in a number of films for years to come. If you enjoy this film, don’t hesitate to check out Abduction in the Caucasus (1967), The Diamond Arm (1969) and Ivan Vasilievich Changes Occupation (1973), all Gaidai classics and enduring super-hits. I have written about this film previously in My Top 5 Romantic Storylines post. But this endearing and heart-warming Soviet take on Pride and Prejudice is worth promoting again. Especially considering that Mosfilm has finally put the full version of it on their YouTube channel.